“Mobile Apocolypse”, “Mobile SEO-Pocolypse”, “Mopocolypse”. Everyone is making a huge deal about the pending Google mobile alogorithm change. “The sky is falling, the sky is falling!”. Enough already! Yes, it is expected that the change will be ‘significant’ as Google puts it. What does that mean exactly? Who knows? However, most are saying that if your site isn’t mobile friendly according to the google criteria, then come April 21st, your site might disappear from, or experience a large drop in, the mobile SERPs and possibly the desktop SERPs as well. What if this happens to you? Then fix the issue and continue on. You can see the full Google blog article here. It’s a few years old but I think the philosophy is still the same. So what should you do about this mobile apocalypse? 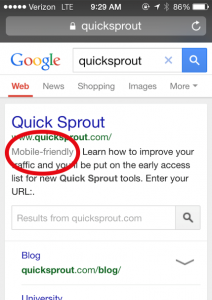 Well, you know it’s coming so check your site using Google’s mobile friendly test. Keep in mind that this test is not 100% but it will give you a good idea. 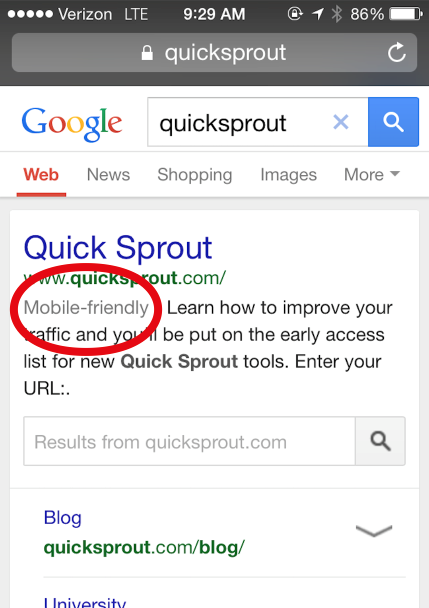 Use the mobile usability check in Webmaster tools and/or query your site on a mobile device to see if the results are returned with a “mobile friendly” indication as part of your search description in the SERPs. See below for an image from searchengineland.com that illustrates what a mobile friendly site would look like in the mobile SERPs. If you get ‘hit’ by the upcoming change, then take steps to determine if one or more of your webpages are not mobile friendly and fix them. Keep in mind that if you haven’t been focussed on enhancing your users’ experiences then there may be much more to it than just how the webpage is rendered on a mobile device. How do you fix the errors? Get help. Companies Custom-Fit SEO, an Ottawa SEO company, can help. Check out their Facebook page and/or their Twitter page.